The notions of all door boarding with roaming enforcements elicit wails of objection over the eventual system collapse because of fare evasion. Sorry but the near consensus of mature middle class guilt driven values of paying one’s fair share mean that even the evaders start paying as they too mature. What’s my point: read where the tell all bus driver says the rules require that he ask for a fare twice. Meaning it’s a non problem. The CTA world has not and will not fall in ruin over some really small number of “anarchists” riding free. I’ll leave it right there. The bridge issue is crazy – didn’t they vet this with any cyclists? I dunno, from the helmet cam view, it’s pretty obvious you stay left onto the ramp. The bridge over north LSD at 1800 N has a worse setup, it splits and one half goes to stairs, the other to a tight ramp. Granted it’s a much shorter bridge (no train tracks to cross, just LSD) and often more congested, so you’re not likely to build up speed. There are proof of payment systems all over the world including other US cities. I really like it in London where some of the new routemasters have 3 entries. front door by the driver if you need to pay cash, big double door with wheelchair lift in the middle and rear entry with stairs to go up. All doors with Oyster points. Both ends of the bridge have the same issue if you’re not paying attention as a cyclist. The pavement markings lead you in the right direction, but when you see the openings on your right, you don’t easily recognize that they’re stairs — not alternate ramps — till you’re on top of them. 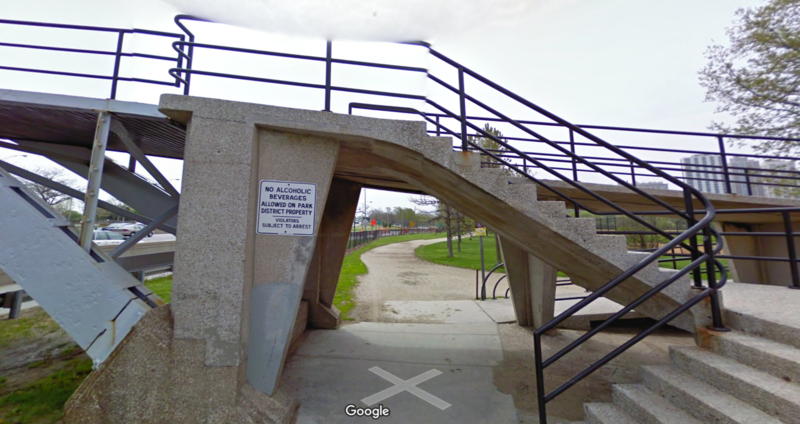 Some signage should help, but I hope they tweak the designs for the 43rd St. bridge as a result of this! I guess the “building up speed” issue is due to the length of the bridge? I probably would never have imagined that would be an issue, so hope they can fix it. The designers were all caught up in the beauty of the all the sleek curves. Even a blind person could end up taking a spill. Continue a railing along the white line with a hard right turn required at the steps to get to them. The railing would seem to be the permanent fix (and one most likely to not lead to lawsuit settlements). that’s my guess. it is pretty long. also it’s winter and there aren’t people going to the beach, so it’s uncongested. a hot summer day would likely see a lot more use. Yeah but you shouldn’t be riding your bike over that bridge. Signage specifically says to walk all bikes, and the ramps are really too steep for most people to comfortably ride anyway. If you obey the signs, no hazard. In theory the added convenience and speed from all-door boarding (or turnstile-free train stations) increases ridership/farebox revenue and provides added funds for roaming enforcement, which in turn generates ticket revenue. I only saw a fare inspector once in Europe, but enough of my friends have gotten costly transit tickets in European cities that I’m sure the enforcement is robust. I don’t know how to bring it to the US in such a way that it doesn’t amplify existing racial biases, but putting inspectors into the transit union (instead of police) and lots of minority hiring should help. Not to be snarky, but as a Chicago native of a certain age, I remember very well when people constantly tried to, sometimes successfully, board via the back door to bypass paying the fare. At one point in the early 80’s on the State Street Transit Mall they had supervisors with token taking abilities (like those change dispensers old school train conductors used to use) open the back doors to speed boarding at evening rush hour – buses back then were more crowded, slower and in far worse shape too. All of Europe doesn’t do proof of payment either (looking at London, Stockholm, etc). I seem to recall that Vancouver relatively recently added faregates due to high fare evasion. It’d be one thing to eliminate fares, but until then, it won’t work – local example, back when the IC still ran their commuter service (Metra Electric) they started checking all tickets due to high fare evasion at the turnstiles (a lot of them were often out of service too – the IC along with PATCO in PA-NJ were early magnetic stripe ticket adaptors) . It was also a hassle with the South Shore trains which didn’t use the same tickets (which continued into Metra’s era as well) and they finally got rid of the turnstiles. If you had a lot of friends getting tickets for fare evasion, that seems to indicate fare evasion was a pretty big problem.